This Town, the new offering by The New York Times Chief National Correspondent Mark Leibovich is so inside the Beltway the nation’s capital becomes a cul-de-sac.! 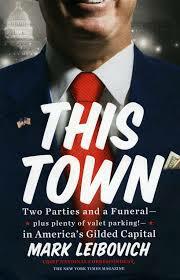 Leibovich promotes the book by warning, ” This Town does not contain an index. Those players wishing to know how they came out will need to read the book.” The reason the book has attained The New York Times Best Seller List must that every mindless egotist in DC has taken the authors advice. Unless you are a true political junkie there is not much here but it is a fun read for those who love politics and a few bold face names. The book reminds me of watching cable television on a very light news day! Light, anecdotal and gossipy, this tome could easily have been named The Club, the high level of membership attainment which the author refers to as the elite of Washington DC. In reading This Town it is clear that Leibovich has attained membership in this esteemed group, having been given the imprimatur of a mention in Playbook. You will learn that one has not arrived in the DC social media world until so recognized by this daily Politico tip sheet. That honor at one time belonged to The Washington Post, and who knows it may again under the ownership of Jeff Bezos! Leibovich is kind to most in the book. Two noteworthy exceptions are Harry Reid and Arianna Huffington. Harry Reid apparently never says goodbye during a phone conversation, he just hangs up when he has nothing more to say. Disingenuous best describes the daily activities and personal relationships in This Town and the author offers little hope that anything will change. A depressing thought. OVERLOOKED? 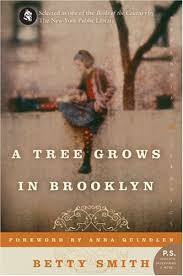 THEN GET A COPY OF A TREE GROWS IN BROOKLYN, NOW!! How wonderful to discover a highly acclaimed book that perhaps even the avid reader may have overlooked. That was certainly the case for me when I came across a copy of the 1943 American classic A Tree Grows in Brooklyn, first published in 1942 , written by Betty Smith. This is an ” honest and True” novel about a young and very poor Irish girl and her family living in Brooklyn, New York in the early 1900s. The book is so autobiographical in nature that there was a 1943 lawsuit by an individual claiming to be the prototype for one of the characters! Young Francie Nolan faces all of the challenges that life could muster including poverty, an alcoholic and yet somewhat heroic father, birth and death and an economy that offered little opportunity for an immigrant family, let alone a young girl. The story is reminiscent of Frank McCourt’s Angela’s Ashes, but Smith’s portrayal of the fortitude of Francie sets a very high standard for storytelling. Francie’s mother, brother and the other ” Irish family” members are portrayed in wonderful detail and the book is a valuable insight into a period of American city dwelling immigrant history that is important to readers of any age and gender. I am glad that this wonderful novel did not escape me and I highly recommend it to you and any members of your reading family. Further acclaim for A Tree Grows in Brooklyn came in 1945 when Twentieth Century Fox released the movie, the first film directed by Elia Kazan.